My wife knows me pretty well. At a recent garage sale, Kris picked up the November 1939 issue of American Cookery magazine. She wanted it for the recipes. But after she was finished, she handed it off to me. “You'll want to look at the ads,” she said. She was right. Fun trivia: American Cookery magazine was originally called The Boston Cooking-School Magazine. The Boston Cooking-School Cook Book was first published in 1896 and written by Fannie Merritt Farmer. When I was a boy, my mother regularly used a modern edition of this cookbook, which we knew as “the Fannie Farmer cookbook“. 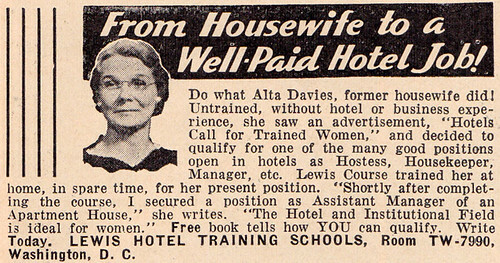 I was particularly pleased to see that there were so many ads for home-based businesses. I wasn't aware that there were so many female entrepreneurs in the late thirties. This was at the end of the Great Depression, of course, and it may be that economic necessity had made this sort of thing more acceptable. Tip: Click any image in this post to go to its Flickr page, where you can view the ad in more detail. 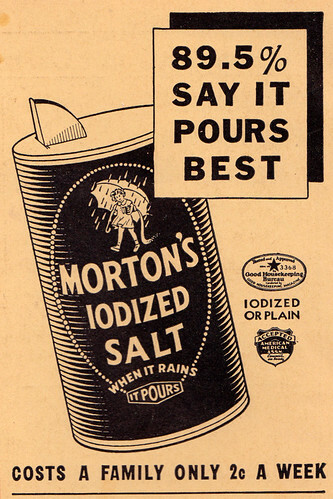 Note: I love the ads in old magazines. I've shared some of my favorites here at Get Rich Slowly before. 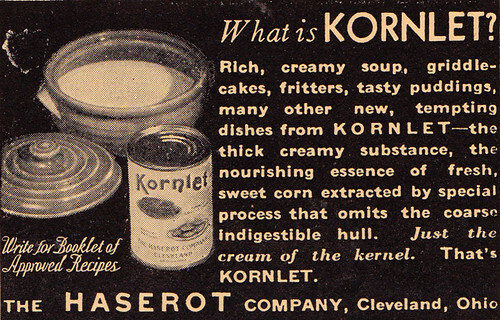 There are 26 reader responses to "American Cookery: Magazine Ads from 1939". Wow, that book on table setting looks awfully thick! Those get rich from home work ads look an awful lot like what shows up in my spam filter these days. Only the number per month has changed. More evidence that some things are eternal. “Autumn-Winter Cheese Cookery”!!!! OMG, I can’t wait! After the Spring-Summer Cheese Cookery it’s my fav! 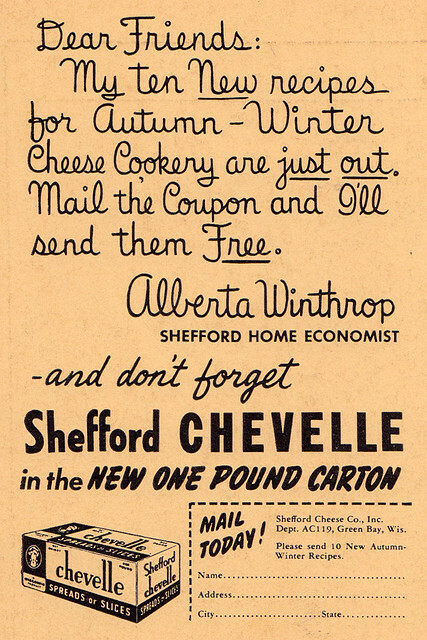 So Couponing started since 1930’s? I still use those no sew turkey “laces”. I also kept my grocery compare list from when I was a freshman in high school. Not only is it interesting to see the prices- but what my family bought normally for dinner (many items started with TV). based upon this article, I found a ebook ‘Spending the Family Income’ by S. Agnes Donham. There is an eerie similarity to books written in the last few years considering it was written in 1924. I wonder how many people took her advice to build up an emergency fund, 5 years before The Great Depression. 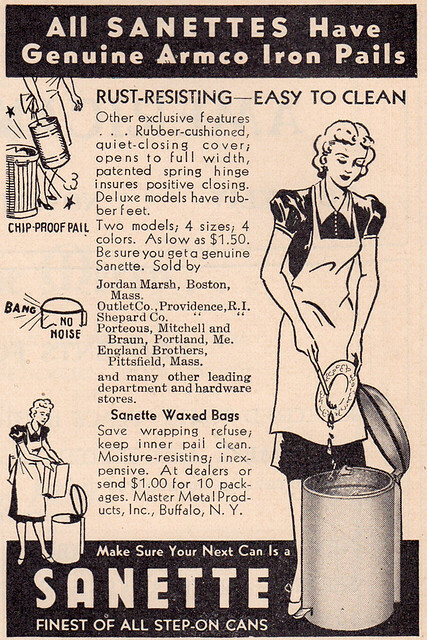 You should keep an eye out for Workbasket magazine, I used to have a stack from the 1950s and they all included ideas for women to make “pin money” — not ads but articles and instructions. Pretty neat stuff. there are a ton more if you search from price low to high– those costing $0 are usually stuff from Project Gutenberg with expired copyrights and generally ancient. I wish I could get my husband a copy of “Let’s Set the Table.” After 20 years of being married to me, he still has to ask which side the fork, knife and spoon is placed. But, at least he asks me! 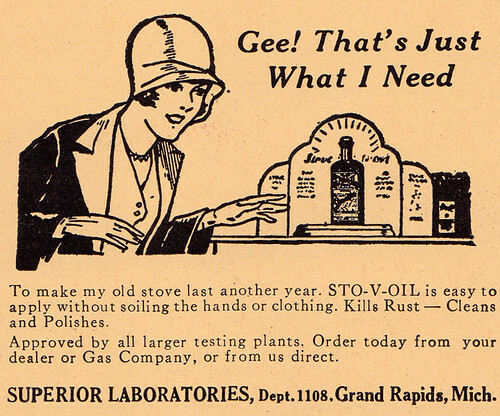 I always love these old ads, and old cookbooks. I have some classic old cookbooks that I inherited from my great-grandmother and grandmother. The measurements and instructions in some of the old recipes are not as precise as they are now. I guess it was assumed you should know what temperature a “hot oven” is and how much “a handful” would be. For your husband, “left” and “fork” have the same number of letters. Also, “right,” “knife,” and “spoon” have the same number of letters. You’ve just saved me future years of confusion. Have you been to Periodicals Paradise? It used to be on Hawthorne and now it’s on 42nd in the Hollywood district. @Murray. Good advice, but only if they then kept the emergency fund under the mattress. Remember how many banks went bust during the Great Depression, ruining the small depositors (not just the shareholders)? I know a lady that sells old magazine ads from magazine on eBay. She make pretty good money that way too. Sounds like a very cool book collection that you’re building up! My wife loves old books (and still prefers new hardbound books to devices like the kindle). Isn’t it awesome to look at old ads & books? Things change so fast. I also found a Canadian War-time canning manual which was such an awesome find, I hope to try some canning this year with my family and we intend to go through it to see if any of it can be of use to us 65+ years later. Off topic from the old ads, but here’s a fun emergency fund related story from today. If you find a dead deer under your deck, guess how much it costs to have it hauled away? Thanks for the free kindle titles ElNerdo! : ) I consider myself kindof a home-ec nerd, so these are great! 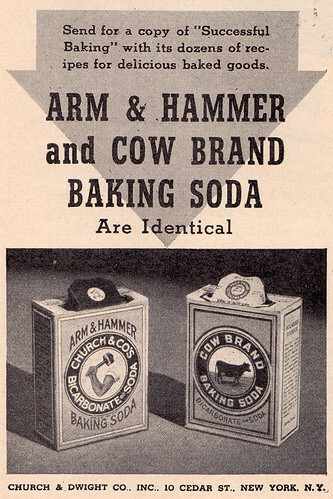 Interesting to see the old ads. My mom has been a long-time National Geographic subscriber and has literally *decades* of issues she’s kept. I’ve spent many hours over the years looking through the old NG issues/ads from the 1960s and 1970s. You may enjoy a comparative view of ‘Mrs. Beeton’s book of household management’. Mrs. Beeton defined the early cookbook for most Britons, much as Fanny Farmer was a classic in the US – still published today. – the advice about choosing and training domestic staff. Its 2751 entries include tips on how to deal with servants’ pay and children’s health, and above all a wealth of cooking advice, instructions and recipes. It was an immediate bestseller, running to millions of copies within just a few years. I’m just glad that it’s unlawful to discriminate against women in hiring and pay scales. It wasn’t that long ago (about 40 years) that women were paid less than men for the same job, or weren’t hired at all for certain jobs (usually the better-paying ones). And those colleges and trade schools that did admit women had tiny quotas for the number of women in each class that could not be exceeded. 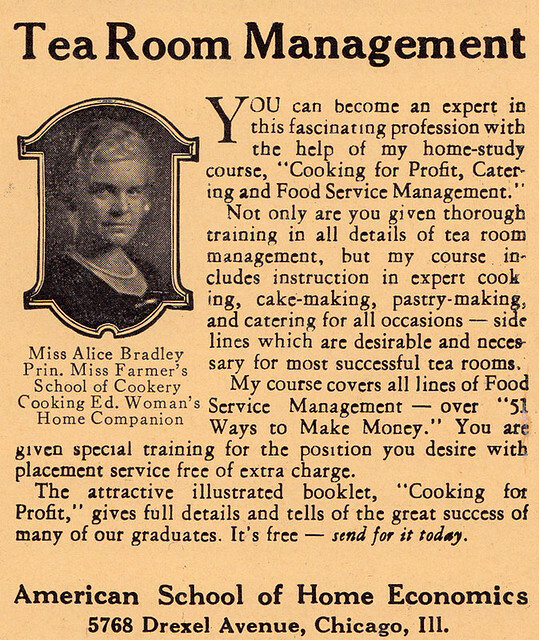 Women had few alternatives to baking cakes and running tearooms, in other words. Betsy, you say that like pay inequity is a thing of the past. Wow, it’s amazing how far marketing has really come. Neat. Wish my grandfather and grandmother (born 1914 and 18) were around to talk about this. Have written before about thier influence on me and my views on money mgt. It was so interesting to talk about the Great Depresion and life in the 20’s-60’s with them. J.D. 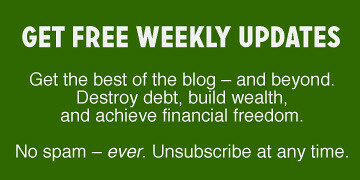 I know that my grandparents would be so impressed with this site and would congratulate you on your views on finances and how you and Kris have helped so many people get debt free. The WWII generation truly were special. We need to heed their advice. I would love that table-setting book. Things like knowing how to set a table (and identify a salad fork and use it!) and even how to use a napkin are a sadly lost art. Manners are too. Let’s have more beautifully set tables and civility, please. I picked up a December 1970 issue of Woman’s Day a number of years ago and my kids and I loved looking through it. Ads that included 7 cent off coupons! The cigarette ads! The one they find the most amazing is the cigarette ad that touts the new pretty box. “No more ugly cigarette box” The ad for formula that describes a father getting up in the middle of the night and the new packaging makes it easy “even for father”. A whole lot of historical learning in those ads!